What do you do when your iPhone rings, and it’s freezing outside? You’ve got gloves on, and the touch sensitive display won’t respond to your mitts. 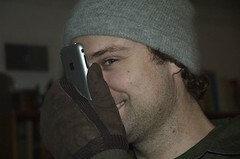 Either you can take off your gloves, and freeze your fingertips off, or Eskimo-kiss your iPhone. Two bits of advice: get some practice in now before your nose starts running on a daily basis, and get used to wiping your nose on your glove before touching the iPhone, otherwise get used to cleaning the crusties off of the display.